Yesterday really was a hot, sticky sort of day. Really it needed some rain to clear the air, but sadly this didn't arrive until today, coincidentally a few minutes after I'd pegged the last item of laundry onto the line to dry! After a morning in the park, I settled down for an afternoon of sewing. 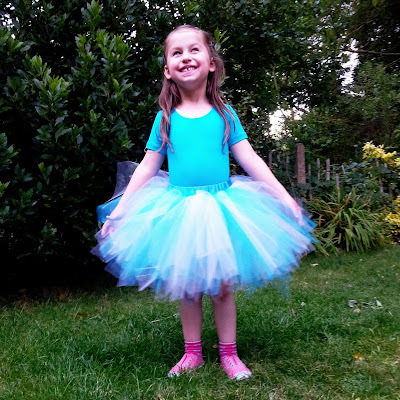 With only two weeks left until the start of term, I had a tutu to make. M had already designed her idea of the perfect tutu. We chose suitable tulle together. We visited Hobbycraft for sewing supplies a few weeks back. All I had to do was make a five year's vision reality. I started on this project two weeks ago, getting a little distracted last week by the need to make a tutu for a horse, but with a deadline looming I wanted to plod on with it yesterday in case something went wrong. I'm always a great believer in leaving yourself time to fix things, rather than having a disaster on your hands at the very last minute. This took a long, long time. Once the gathers were done, I cut a piece of bias tape 11cm bigger than M's current waist measurement. That was 8cm ease, to get it over her hips and up to 3cm seam allowance (SA). I marked the SA, then pinned the gathered tulle in place, adjusting as I went. I'd gathered in three pieces, one for the front and two for the back (allowing for a centre back join) because it allowed me to control the gathered fabric's distribution. Pinning the tulle in place was fiddly, mostly because the stuff has a mind of its own. After that, I sewed it in place very carefully, repeatedly stopping to move the tulle away from the needle and feed dogs, keeping everything as tidy as possible. 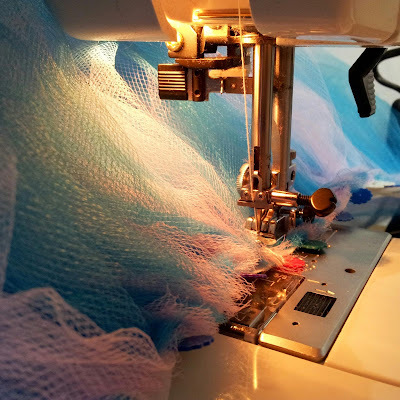 Securing gathered tulle to a piece of bias tape. Yesterday, my task was to add the waistband to the resulting proto-tutu. My waistband is made from two pieces of satin ribbon, sewn together along once side, pressed, then sewn to make a loop. I pinned the gathered tulle into the waistband, sewed it in place, folded over and secured it by sewing again, leaving the last 15cm unsewn so I could insert the elastic. I decided to use woven elastic as it is suited to heavy duty waistbands, which seemed appropriate for dancewear. My hope had been, that by sewing the gathered tulle onto tape first, I'd tame it a little before attaching it to the waistband. I'm not sure I was successful, as it was still really fiddly to get the tulle pinned in place and very slow, careful stitching was required with the sewing machine. The elastic was a tight fit to the resulting casing, which was why I'd left such a large hole to insert it. I'm glad I did, because some wrestling was involved! I secured the elastic, first to the inside of the waistband, and then to itself, before closing the casing by hand. I had intended to sew it with the machine, but the fit around the elastic and gathered tulle was so tight, I couldn't be sure I'd not catch the elastic, so sewing by hand seemed the safer (and quicker) bet. 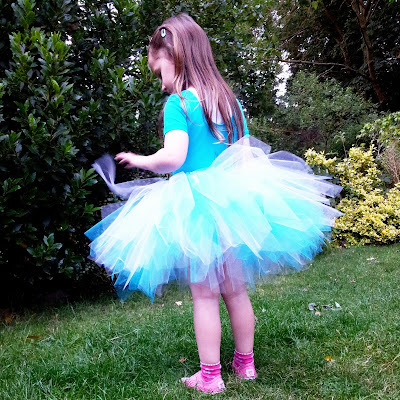 Casing closed, a bit of wriggling to evenly distribute the tulle around the elastic and finally I had a finished, wearable, extremely floofy, full tutu. Just as M had planned. Back and side view of the tutu. Cue a very, very happy little girl.